Marco Porello (shown here) is the third generation of his family to craft wines from the family estate in Roero, located northwest of Alba on the left bank of the Tanaro River in the Piedmont. Roero was previously an inland sea, which explains the marine sediments that influence its wines. 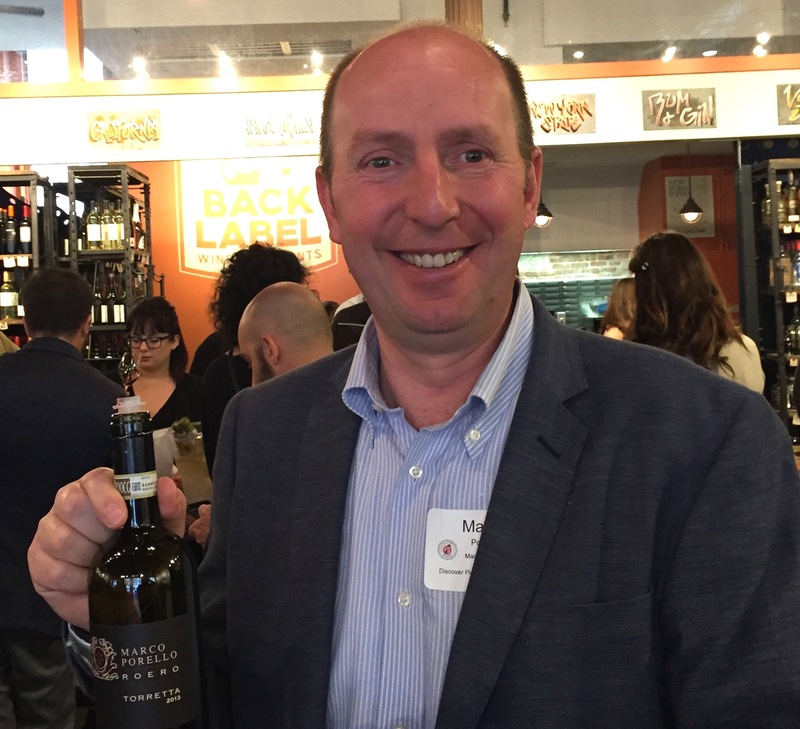 We recently met Marco at a Consorzio of Roero trade tasting held in New York and subsequently tasted through his portfolio with his importer in the Washington DC area. Our tasting notes are given below. We find his wines to be very well made and exceptionally good values. 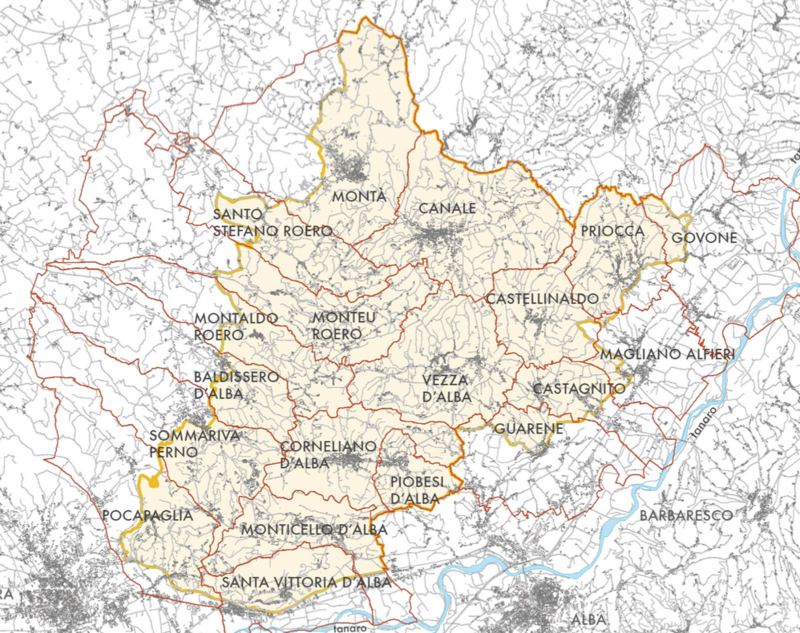 Marco has 15 hectares of vines located in two of Roero’s twenty-three villages, Canale and Vezza d’Alba (see map below), and in some of the region’s most highly regarded lvineyard ocations, including Mombirone in Canale and Tanone in Vezza d’Alba (shown here). 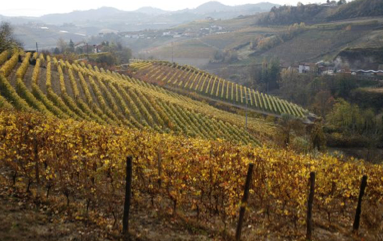 Barbera and Nebbiolo are grown in Canale, while Arneis and Nebbiolo grow in Vezza d’Alba. The Canale vineyard has dense marine, clay soils and two single vineyard parcels—Filatura and Toretta. The Vezza d’Alba vineyard has sandy, limestone soils and is home to the single vineyard parcel Camestrì. Marco Porello 2014 Nebbiolo d’Alba ($16) 89 An attractive, easy drinking Nebbiolo showing notes of red berries and cherry fruit with floral and flinty mineral notes It’s well balanced and superb value. A vineyard blend matured 12 months in 25 hl Slavonian oak botti. Marco Porello 2015 Arneis Classico Roero ($13) 89+ A blend of grapes from both Canale and Vezza d’Alba, Porello’s entry level Arneis is crisp and fresh with notes of pear and minerals and a hint of apricot. It has very good balance and length and is an exceptional value. Marco Porello 2015 Camestri Arneis Roero ($15) 90+ Showing a rich, complex nose of almond, beeswax and a hint of ripe citrus, the single vineyard Camestri from Vezza d’Alba has good intensity of flavor on a full, round, firmly structured palate with excellent length. This wine was first made by Marco’s father in 1996. Marco Porello 2014 Favorita Canale Langhe ($12) 89 With a bright citrus nose with hint of fresh herbs. the Favorita is soft on the palate with citrus like flavors and a hint of tangerine that mirror the nose. Richly flavored. Superb value. Marco Porello 2014 Filatura Barbera D’Alba ($12) 90 This Barbera has an exuberant, richly aromatic nose of red fruit and a smooth, surprisingly rich palate with very good depth of flavor and a lingering finish. 100% Barbera d’Alba from the single vineyard parcel Filatura. Fermented in stainless steel and aged 12 months in barriques. Marco Porello 2013 Toretta Roero ($22) 91+ Showing a bright nose of pure red cherry, the single vineyard Torretta is broad on the palate with good flavor intensity and a firm underpinning of structure, finishing with rich dark cherry extract. Incredible value! Aged in 500L French tonneaux for 18 months. This entry was posted in Countries and Regions, Italy, Red Wine, Uncategorized, Wine Type and tagged Langhe, Nebbiolo, Piedmont, Roero. Bookmark the permalink.